Growing up in rural New Hampshire, my family had a small “farm” of various animals such as pigs (named Quasi and Modo) chickens (with various handles such as No Toes and Dum) aquariums, aviaries, a pirate-swearing parrot, a horse, donkey, sheep, geese, dogs and whatever else happened by… they (ahem, Debbie) aptly named Funky Farm. The driveway sign from our New Boston home currently hangs in my favorite apple tree in the middle of my backyard in Wyoming. Only a handful of days at my Oxapampa host family home, I am pretty sure the Funky Farm sign belongs here. Week Six is the first installment of 15-18 days of Site Exploration. 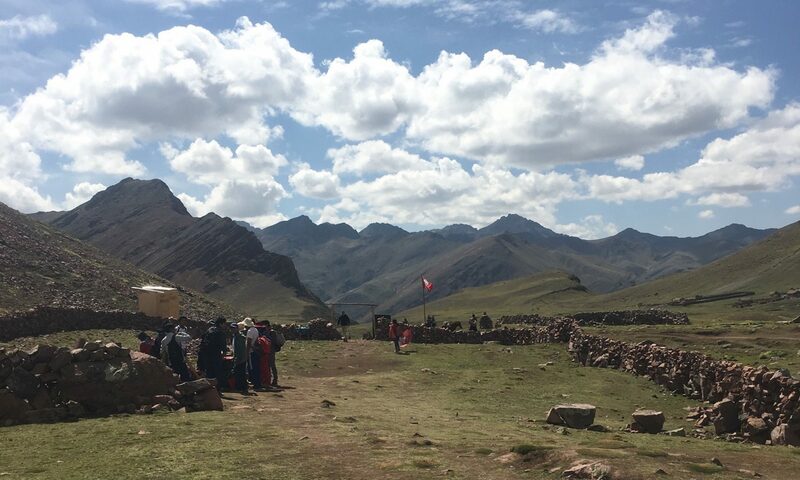 The 48 volunteer candidates of Peru 31 (CED and WASH programs) traveled in regional groups to department (state) capitols (or a designated regional center) to have two days of orientation programming with potential socios (work partners) and new host families. After meeting our families for the day, we each went off to our future homes. We return mid-May for four more weeks of training before swearing-in as official Peace Corps Volunteers. I am lucky. Like look-over-both-my-shoulders-lucky because this feels like too much windfall. First, I got the site placement of Oxapampa: a great size, mild jungle mountain weather, burgeoning tourism, and beautiful landscapes with bio-reserves and a national park. Next, our site training happened to be in Oxapampa – this meant no extra travel for me and my future work partners and family. (Other volunteers had over six hours one-way back in the direction of Lima. Sorry Cara.) Third stroke of luck: Socio Day & Family Day. Turns out I was paired up with two very eager & excited tourism specialists who are not in the least bit afraid of my Spanish foibles, or taking on an extrañera. Finally, I met my host family mom Paulina and we immediately hit it off when I held up an “Adopt Me?” sign with her name on it. My Future Oxapampa Home: Paulina lives with her daughter Jenny. Together they make a fierce, boisterous, and joyful home of powerful women and wasted no time teasing, hazing, and hugging me. Their land, just a few blocks from downtown Oxapampa, includes two more households, with Pauli’s son Luiz & family, and daughter, Noemi & family. Like the funky farm of animals, I am still learning who is responsible for whom. Funky Farm South: 12 chickens, 2 roosters (who could take a memo about early Sunday mornings) and 24+ teenage and day old chicks. Six ducks and 12 ducklings. Three to six dogs and four two-week old puppies. Three teenage kittens more savvy at hunting kitchen scraps than the dogs. Some anti-social guinea pigs. One of the black puppies with no white feet hasn’t opened one eye yet so I am not-not-naming him Pirata. Please note: I do not like puppies. I do like other people’s puppies (OPP). Friday I had my first work appointment at the Oxapampa Municipality and understood about 10% of it. I am sure we will enjoy joking about this fact in two years when I understand them. The economic team has a lot of work waiting for me when I return in June and in turn, I have a lot to learn to be of use. First up, they want me to help write their Pasco regional tourism marketing materials in English and train local guides in basic English. This is going to be fun. Finally I was able to use my “extra nervous energy” (you know, not being about to fully communicate) into good use by serving food, clearing plates, frying bread, and washing dishes. I am good at that in any language or cultural context. Despues, I ate fried dough and locally grown and brewed coffee pasado and was happier than this pile of puppies. My hair is as wild as the surrounding humid jungle. I am pretty sure my socios have signed me up for a public presentation to thousands (ha) on local television. I admiringly empathetically and enviously watch Peru 27’s outgoing volunteer class at Senioritis ending of service while I stand bewildered and like a brand new one-eyed ewok puppy on Day 48. Then there is the rest of my group. I wonder how the rest of them are fairing at their initial welcome to the next two years. It is always prettier on Facebook. Week Seven involves heading out into town and having meetings with more socios, departments, schools, banks, maps, and finding myself a potential in-site tutor. Until next time, here is my new room with a view of Funky Farm South (Sud). Love to read your reports and see your pictures. Thanks Suzie. I am looking forward to sharing this Funky Farm South with you when you visit! Thanks for the note Carol! You totally get the humor and spirit of Paulina and Jenny. It is going to be a really good home for me. MISS YOU MORE. Que maravilla! Cachorros, pollos, y pueblo!